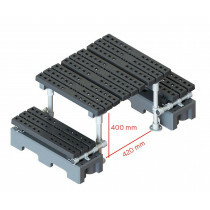 Our mini step-overs come partially assembled and can be put together on site using a simple Allen key. 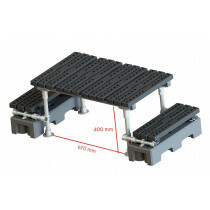 The KeeWalk platforms are strong and sturdy, and can be used both indoors and outdoors, even in harsh environments. Various sizes and styles are available from stock. Freestanding and fixed options available. Custom orders possible. 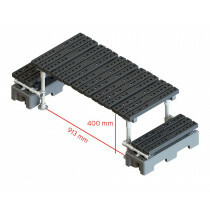 Our mini step-overs have been thoroughly tested for strength and longevity, and are compliant to EN 516 Class 1-C.
Our range of mini step overs will help you eliminate tripping hazards associated with low lying pipework, tube, cable trays, wires or any similar obstacles. 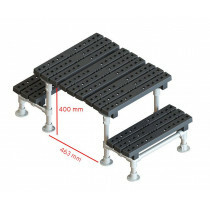 Available as kits, our modular step-overs are really easy to install using just an Allen key. These come party pre-assembled. 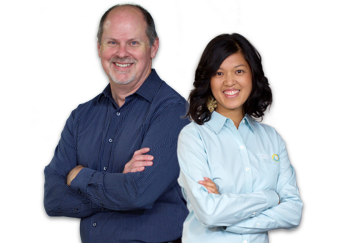 We keep a variety of styles and sizes in stock, which means that we will be able to deliver them to you in no time. When should you use a step-over? 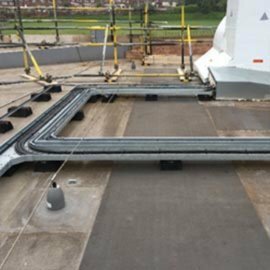 Exposed pipe trays present a risk of tripping, which can make roof maintenance tricky. 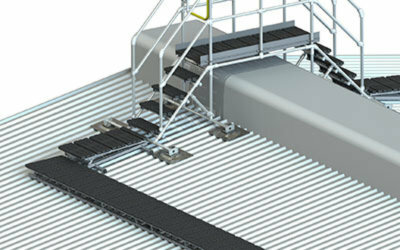 A series of low level obstacles represent a big tripping hazard in any environment, whereas this is a roof or a factory. 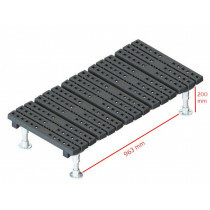 Cables and trays can easily be damaged if stepped on. This also implies additional costs for repairing and replacing the items. 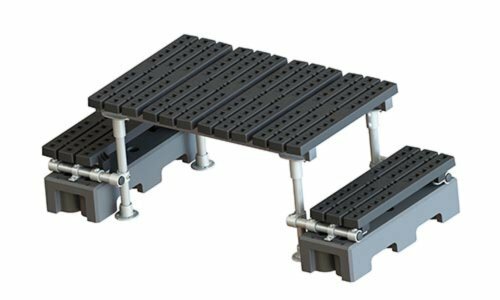 Depending on roof or floor layout, you can either use fixed or freestanding step-over platforms to avoid tripping hazards. 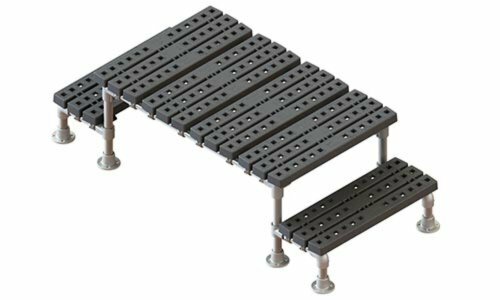 The fixed version will require drilling onto the floor, whereas the freestanding option will not penetrate the surface at all. 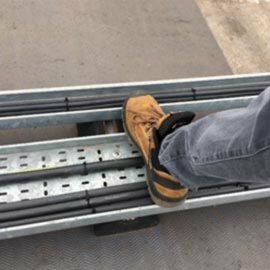 Application: The Kee Walk Step Over System provides a safe, anti-slip, level walking surface for means of access to and across roofs. 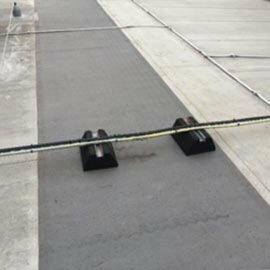 It provides a demarcation route which protects the roof membrane from unnecessary foot traffic and potential damage. Supplied part assembled. For flat roofs. 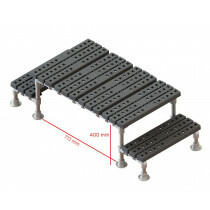 Materials used: Malleable cast iron, aluminium alloy, high grade nylon, PVC, mild steel. Uses Kee Klamp fittings. Drawings: Included on individual Kee Walk product pages. Dimensions included. 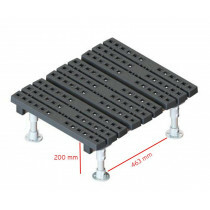 Our range of mini step-overs have been tested to EN 516 : 2006, Class 1-C. 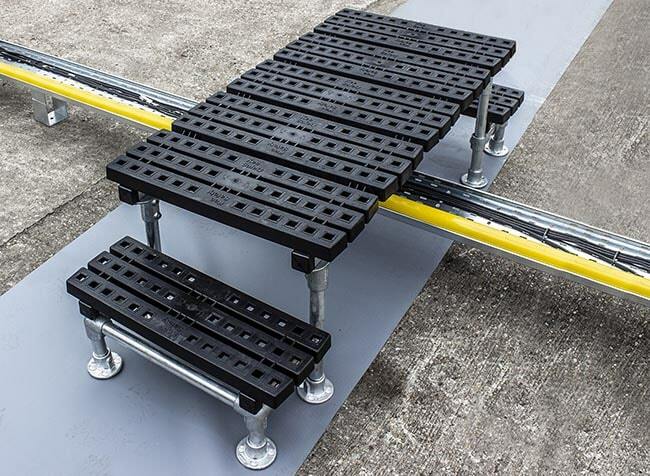 This standard that describes 'Prefabricated accessories for roofing. Installations for roof access. 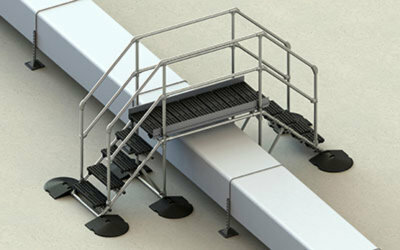 Walkways, treads and steps'. 1.5k/n load applied over 100mm square area and must not deflect more than a given amount. 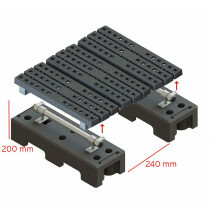 2.6k/n load applied over 100mm square area and must not have residual deflection more than a given amount. We measure the deflection to the millimetre using a wire transducer. 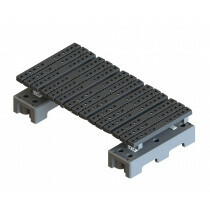 The Kee Walk mini step-overs are provided partially assembled and flat-packed. 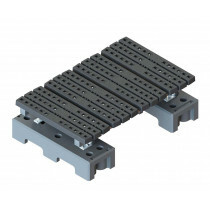 We send them out on small pallets, for ease of transport and reduced shipping costs on our customers' behalf. Full assembly instructions are also provided with the units. 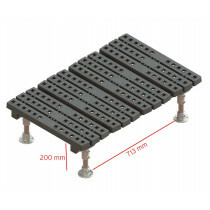 Because we stock the mini step-overs, delivery is made quickly which means that you will receive the units in no time. 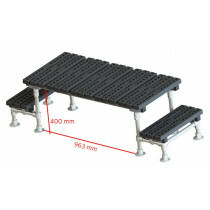 Looking for a bespoke step-over platform? Either browse our bespoke step-over gallery for a quote or send over your requirements.